Cranes and other pieces of heavy machinery are commonly found on construction sites in Georgia, and are typically used to lift and transport construction materials and workers to areas that aren’t accessible with a ladder. While cranes are essential for many construction projects, the presence of cranes on the job site also puts workers at risk of serious injury or death if the crane is defective or misused. If you or a loved one has suffered injuries caused by a crane accident on a construction site in Georgia, contact our experienced crane accident attorneys at Rechtman & Spevak today. Our construction accident lawyers are familiar with Georgia workers’ compensation laws, and can help you pursue compensation through a workers’ compensation claim or by filing a third-party liability lawsuit if your injury was caused by someone other than your employer. Because construction accidents pose such a serious risk to workers, there are certain safety regulations established by the Occupational Safety and Health Administration (OSHA), Georgia construction laws, and safety manuals that accompany heavy machinery, all of which should be followed on a GA construction site. According to these laws, a crane must be properly maintained, properly supervised when in use, operated by adequately trained workers, and outfitted with proper warning labels and instructions. Unfortunately, when one or more of these safety precautions are ignored, the results can be devastating for construction workers and their families. If a crane accident in Georgia results from the intentional or negligent misuse of a crane on the job site, liability may extend to any number of parties. While GA workers’ compensation laws prohibit workers from suing their employers for on-the-job injuries, an injured worker can seek medical or disability benefits in Atlanta by filing a Georgia workers’ compensation claim with their employer’s insurance carrier. A worker may also be able to pursue compensation from a negligent property owner, general contractor, sub-contractor, architect or equipment manufacturer by filing a third-party liability claim for his or her injuries, medical bills, and other damages related to the workplace injury. Cranes are considered heavy machinery and require the expertise of specially-trained operators who know how they work and can ensure the safety of construction workers in the vicinity. Unfortunately, when crane operators aren’t properly trained, when a crane is defective or poorly maintained, or when a construction site supervisor fails to take proper safety precautions to protect the safety of construction workers, a devastating crane accident may occur. If you have been injured in a Georgia crane accident, or if you lost a loved one in such an accident, contact our experienced crane accident lawyers at Rechtman & Spevak to discuss your legal options. 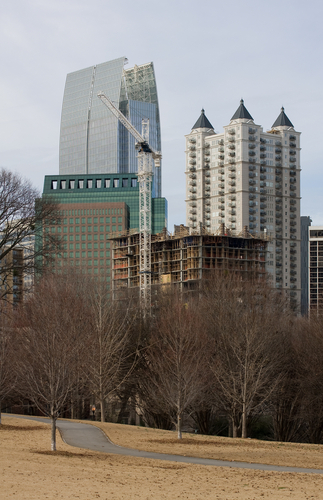 Our law firm is located in Atlanta, and our qualified construction site attorneys can help victims of crane accidents in Atlanta, Marietta, and elsewhere in Georgia protect their legal rights and pursue the compensation they deserve.